The new aid is an add-on module that expands the functionality of electric powered wheelchairs by connecting up the existing wheelchair control system (e.g. joystick, chin control) to a cellphone, PC, TV, games console, etc. via Bluetooth. The interface for data transmission is the wheelchair's CAN bus, where all wheelchair data converges. "The module allows users to carry out all mouse functions – on their notebook or smartphone, say – and thereby check their e-mails, surf the web, and send an SOS in the event of an emergency. All USB-enabled devices are supported," says Prof. Dr. Andreas Wenzel, group manager for embedded systems at the AST branch in Ilmenau. The module is compatible with many electric powered wheelchairs from the Otto Bock range. Box-shaped and compact, its dimensions of 85 x 65 x 32 millimeters mean that it can be discreetly attached to the wheelchair. The box comprises both the hardware in the form of a printed circuit board and the software, and it has two Bluetooth interfaces. Wenzel describes the advantage of the second Bluetooth interface as follows: "The system not only enables interaction with electronic devices, it can also be used to transfer wheelchair data – such as battery capacity, motor currents, and errors in the drive system, for example – to a smartphone." A specially developed smartphone app reads and processes the data. "When users of electric powered wheelchairs are considering going on an excursion, they are often uncertain about how long the battery will last, because the energy consumed by the wheelchair depends on the temperatures outside and the hilliness of the terrain. A wheelchair uses up more power on steep hills than on flat roads. This uncertainty often means wheelchair users choose to stay in rather than venture out," explains Wenzel. The Android app carries out a precise range projection. 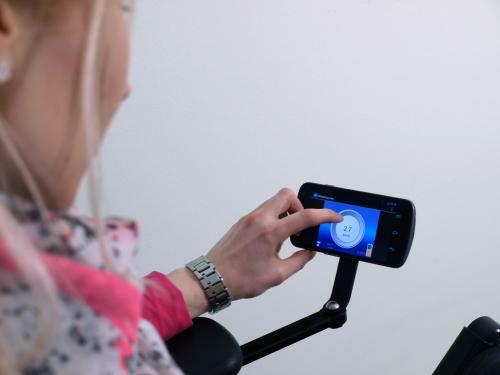 The app determines the current location, compares it against the battery capacity, and calculates if there is enough energy left to bring the wheelchair back to the home point. It obtains the requisite data from the Internet. Wheelchair users are informed how much further they can safely travel via their cellphones. When the capacity begins to run low, a warning appears on the smartphone display telling them that there is only enough power left for another ten kilometers. "This gives users certainty and peace of mind," says Andreas Biederstädt, head of development for e-mobility and drive technology at Otto Bock. "The cellphone can be easily fitted to the wheelchair. Moreover, this enables us to do away with expensive industrial displays." A further advantage of the app is that the navigation functions allow users to call up wheelchair-accessible routes, for example, or disabled toilets. This means users of all-terrain wheelchairs can go off road and receive a selection of suitable routes on their display. "The add-on module offers users of electric powered wheelchairs greater autonomy, safety, and convenience," sums up Andreas Biederstädt. "Not just the disabled but elderly people with restricted mobility stand to benefit from these sorts of mobility concepts with the Bluetooth module." Initial tests have been successfully completed, and wheelchair prototypes equipped with the innovative communication aid have already been presented. Otto Bock is currently planning to produce a pilot run, and the finished product should be on sale from the third quarter of this year. Researchers at Fraunhofer IOSB's AST branch also want to drive the development of this technology. "The next step will see us linking our Bluetooth module up with home automation systems. This would enable disabled people to perform tasks such as setting the air conditioning, opening and closing blinds, and switching on and off lights without leaving their wheelchair," says Wenzel.